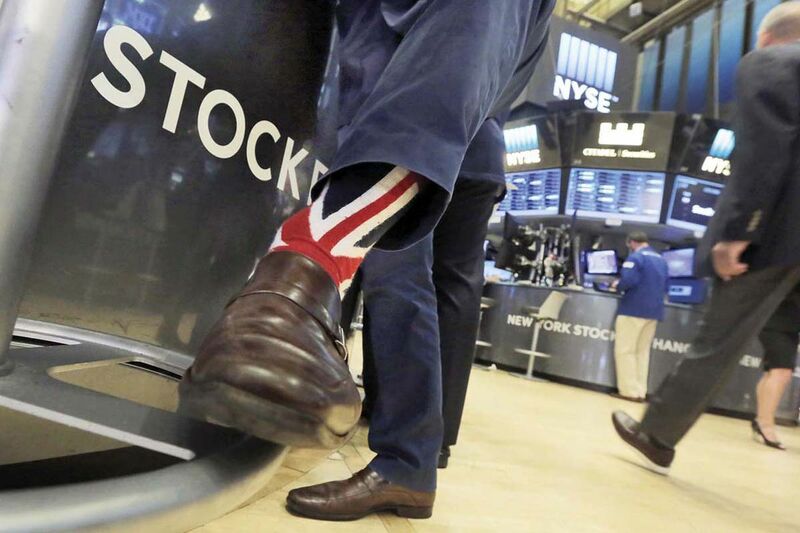 Stocks specialist Michael Pistillo sported Union Jack socks while working on the floor of the New York Stock Exchange on Friday. The British changed the course of history and voted to exit the European Union. Here in the United States, we'll feel that shift in our portfolios, as stocks, bonds, and other assets become more volatile. Gold and other precious metals, on the other hand, were rising sharply as a momentous week came to a close, as were U.S. Treasuries - all considered safe havens. "The long-lasting effects of this volatility will depend on how major central banks decide to reassure markets and the next steps the British Parliament, various political parties in the U.K., and the rest of Europe take to address the departure," Brandywine Global in Philadelphia, a division of Legg Mason, wrote in a note to clients Friday. Uncertainty will overhang markets for the next two years, the time frame for Article 50 of the Lisbon Treaty, which forms the constitutional basis of the EU and the legal framework for Britain's exit. "The U.K.'s departure raises the question of whether other EU member countries follow suit. We believe global central banks will ease [interest rates] more aggressively," Brandywine added. David Kotok, portfolio manager with Cumberland Advisors in Vineland, concurred: "Brexit, Frexit, Itexit, Spexit. Will France, Italy and Spain follow suit?" Kotok's firm raised cash some weeks back and nibbled at buying on Friday in the U.S. housing and consumer discretionary sectors. The Brexit referendum "starts a process, it does not end it. It's an incomplete EU, not a dissolution. Trade and commerce is desired by all, so [the EU] will remain," Kotok said. He sees very low interest rates on mortgages for a long time, with housing accelerating and possibly adding 0.50 percent a year to GDP for "years to come." Bill Stone, chief investment strategist at PNC Asset Management Group, advised clients not to start selling rashly. "A knee-jerk reaction to this vote is not likely to be a wise investment decision," Stone wrote in a note to clients. The S&P 500 has a dividend yield of more than 2.2 percent, while the 10-year U.S. Treasury yields about 1.57 percent, he added. That large a yield spread in favor of stocks "historically provided an attractive long-term buying opportunity. While the short-term behavior of stocks is unknowable, a wholesale liquidation . . . is unwarranted." In other words, don't sell the farm. "Given that it may take several years for the specifics of Brexit to play out, and markets may be rattled as plans take shape, investors' best protection is to hold a portfolio that is diversified across asset classes and regions," Vanguard said in a note to clients Friday. "In Vanguard's diversified balanced funds, such as our Target Retirement Funds, we will continue to maintain global exposures that are consistent with the funds' investment objectives and policies." Still, said Wharton School finance professor Richard Marston, "it's a very depressing outcome to see a people turn inward and reject globalization." The rise of nationalism makes sense, as the British masses feel they have suffered as a result of globalization, Strategas chairman and chief executive Jason Trennert said in an interview. Central-bank policies - negative interest rates, in particular - aren't working for the common man, Trennert said. "Monetary policy appears to have transitioned from ineffectual to mildly harmful," he added. New York-based Strategas was among the few brokerage and research firms to correctly predict the outcome of the Brexit vote. Post-Brexit, Strategas recommends engineering and construction companies "to play what we believe will be an inevitable pivot towards fiscal policy regardless of who the next U.S. president may be. We also believe that nationalistic sentiments will render aerospace and defense a growth industry not just in the U.S., but also in Europe and the Pacific." In real estate, Brexit means lower U.S. interest rates for longer. "Uncertainty will send investors rushing to safe havens, including U.S. Treasuries. As a result, investors and home buyers can expect low interest rates for longer and a pause on interest-rate hikes from the Fed until at least September," wrote Steve Hovland, director of research at real estate investment management firm HomeUnion in San Francisco. "The average 30-year mortgage rate is expected to remain below 4 percent into 2017," Hovland said. According to financial-data company FactSet, S&P 500 companies have an aggregate 2.9 percent sales exposure to the U.K. Even the most exposed sector, energy, derives only 6.4 percent of its sales from Britain. At the company level, 30 companies in the S&P 500 have revenue exposure of more than 10 percent: Newmont Mining (64 percent); Molson Coors Brewing (34 percent); and Allentown-based PPL Corp. (31 percent). Wills Towers Watson, Invesco, BlackRock, Apache, LKQ, News Corp., and CBRE Group had 27 percent exposure or less. Which companies might benefit from Brexit? Should the rest of the EU dramatically reduce imports from the U.K., non-U.K. corporations already making money in the EU might benefit and could effectively serve as the Brexit hedge. According to FactSet, those include Priceline Group Inc., Coca-Cola Enterprises, BorgWarner Inc., Harman International Industries, and Carnival Corp., all with more than 30 percent of revenues derived from the EU without the United Kingdom.